Brahma usually has a beard to signify age and wisdom. 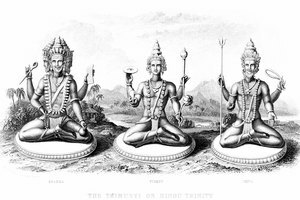 The fundamental trinity in the Hindu pantheon of gods is Brahma, Vishnu and Shiva. Although Brahma is the first mentioned -- the one who created the universe -- he is the least worshipped; only two temples in all of India exist to honor Brahma. 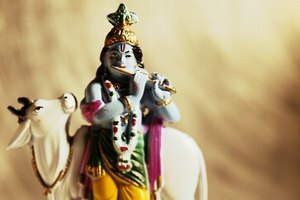 That may be because Hindus consider him more of a wise overlord of the universe than an active participant. Nevertheless, together with his consort Saraswati, he symbolizes the will and intelligence of creation as well as the knowledge of the Vedas. Long before Hindus developed the idea of the three faces of god, or the Trimurti, they spoke of the ultimate reality as Brahman. It is a concept that permeates the Upanishads, a collection of Hindu philosophical writings that is thousands of years old. Brahman, who was earlier known as Purusha, is the omnipotent, eternal source of all things. The Upanishads speak of two aspects of Brahman. Nirguna Brahman is the introspective, self-aware and omnipresent element of consciousness that pervades the universe while Saguna Brahman is the creative principle, or the will to manifest all that exists out of nothing. Brahma's role within the Hindu Trimurti is that of the creator, and Hindus take this to mean that of Saguna Brahman. The role of Nirguna Brahman -- the all-pervading consciousness of existence -- is usually ascribed to Vishnu. The Narayana Upanishad identifies Vishnu as the ultimate lord of existence, although earlier writings tend to identify Narayana, the fathomless source of all, with Brahma. The limitation of Brahma's role to that of active creator is probably the main reason that Hindus worship him less than Vishnu and Shiva. 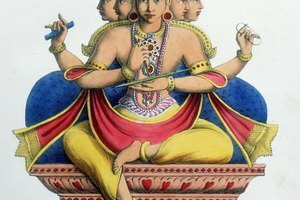 Artistic renditions of Brahma show him with four heads, which symbolize the four Vedas, or holy books, and the four castes. He is often shown seated on a lotus, and his four heads then symbolize rootedness as they look into the four directions at once. He has four hands. One holds a water pot, symbolizing the energy of creation, and one holds a copy of the Vedas. In his other hands he holds a scepter and a rosary. He rides on a swan, which can separate milk from water, a mythological reference to his ability to separate good from evil. All the gods of the Trimurti have female counterparts, and that of Brahma is Saraswati, the goddess of speech and learning. The pair signify many things to Hindus. Brahma represents the knowledge of the Vedas while Saraswati represents the vibrations in the mantras. 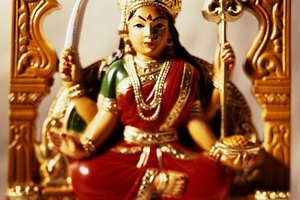 Hindus therefore often worship her as the goddess of music and the arts. 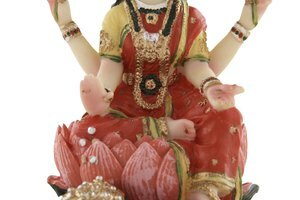 Brahma also signifies pure life while Saraswati is the principle that refines and organizes it into societies and civilizations. Finally, Brahma is the silence of a meditative soul while Saraswati is the clamor and vibrancy of manifested life. Deziel, Chris. "What Does the Hindu God Brahma Represent?" 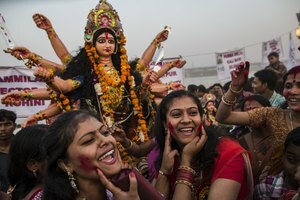 Synonym, https://classroom.synonym.com/what-does-the-hindu-god-brahma-represent-12086329.html. 29 September 2017.